Presented by Artspeaks India, a collateral art exhibition by leading maestros of art who get inspired by Laxmana Dalmia's lyrical verses. Artspeaks India was founded and conceptualized as an arts and culture initiative by Ashwini Pai Bahadur. At the heart of its philosophy is a desire to liberate a language and vocabulary intrinsic to the arts themselves, to provide a scaffolding for form and matter to enunciate their own aesthetic and interpretive frames. In short, to facilitate, highlight, sensitize. Art is subliminal and expression free of compartmentalization. Epitomizing this belief, Laxmana Dalmia, poet, filmmaker and custodian of IPTA (Indian People’s Theatre Association) presents a unique collaborative book wherein poetry and art are in conversation with each other, evoking fresh readings of an age-old tradition, where text and image play off each other. It is been conceptualized by Artistic Director Ashwini Pai Bahadur and curated by Georgina Maddox. 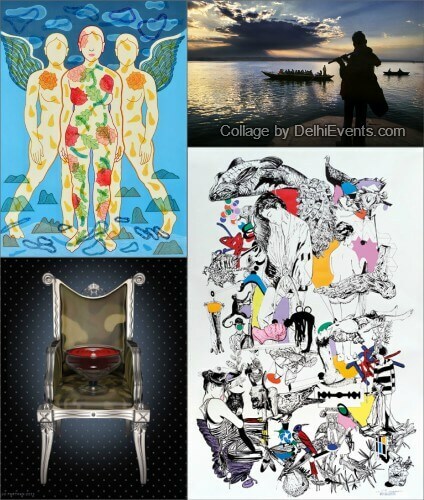 The art exhibition brings together specially selected preexisting works and commissioned artworks by the curatorial team featuring artists like Anjolie Ela Menon, Arpana Caur,,Jayasri Burman, Raghu Rai, Ved Nair, Shivani Aggarwal, Baiju Parthan, G R Iranna, Pooja Iranna, Birendra Pani, Seema Kohli, Sanjay Das, Tapati Chowdhary, Pratap Morey, Kanchan Chander, Binoy Varghese, Rahul Gautam, Sanju Jain, Puja Kshatriya, George Martin, Hemi Bawa, Vasundhara Tewari Broota, Dinesh Singh, Gogi Saroj Pal, Shruti Gupta Chandra , Valay Gada , Shampa Sircar Das, amongst others.